In the first weekend of July, the inhabitants of the village of Wormbach once again celebrated their 'Dorffest' with many guests from the surrounding villages. For two days the guests and families enjoyed the best weather, a colorful entertainment program and cool beer. 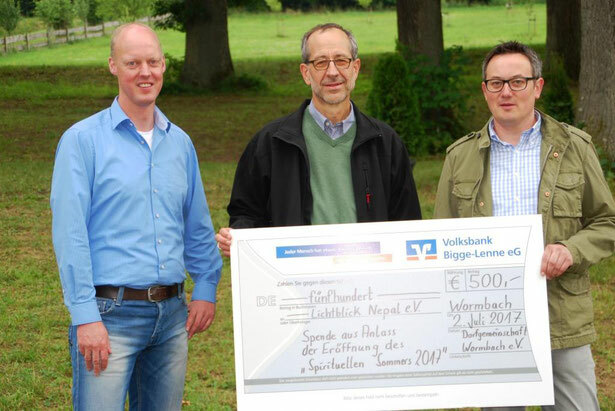 And even the poorest of the poor were once again thought of: Norbert Grobbel handed over a check of 500 euro at the opening of the "Spiritual Summer 2017". 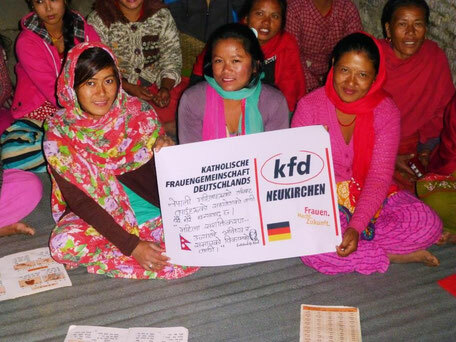 This is not the first donation to 'Lichtblick Nepal', with which the Sauerlanders help people in the Nepalese crises. 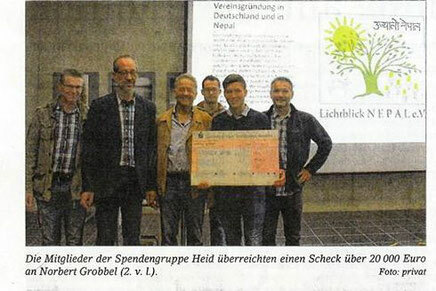 The Wormbacher, the Schützenverein and many people from the surrounding villages have been helping Nepal for years. 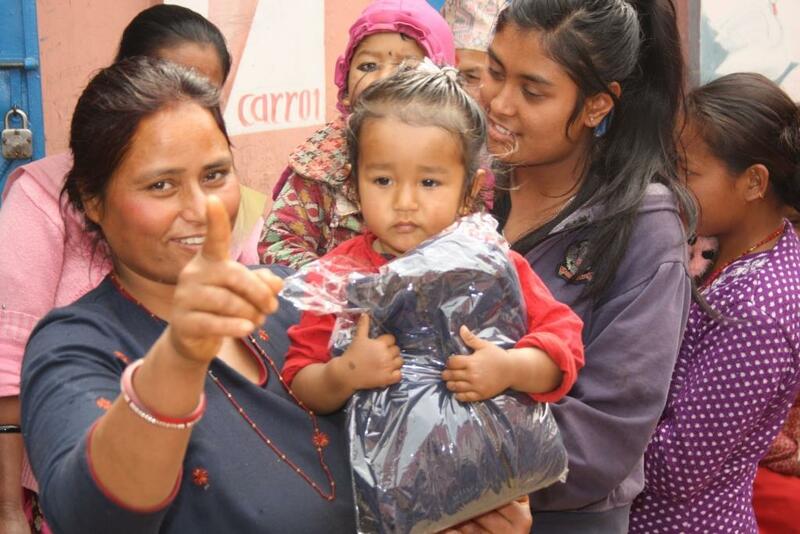 Meanwhile, a few thousand euros of donations have come together; help that is greatly appreciated in Nepal. At this point, once again thank you very much to all donors for the great and valuable support! 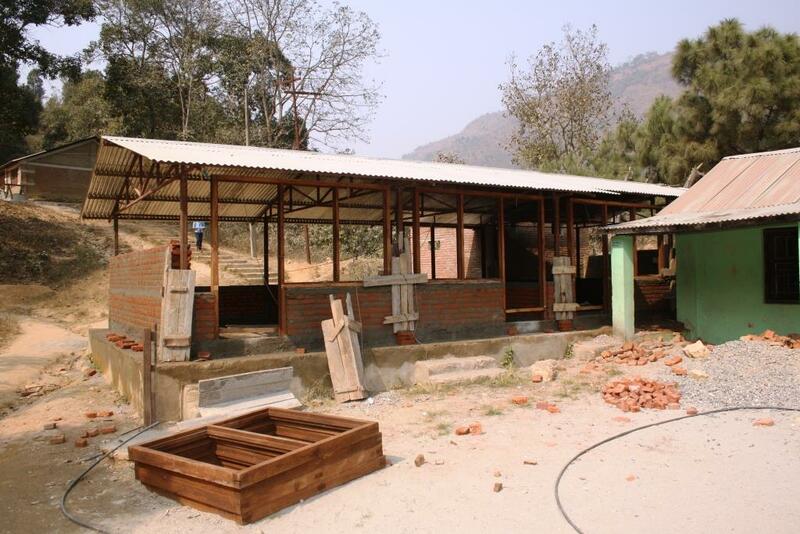 With big steps towards the end: The reconstruction of the school in zero kilometers is almost completed. 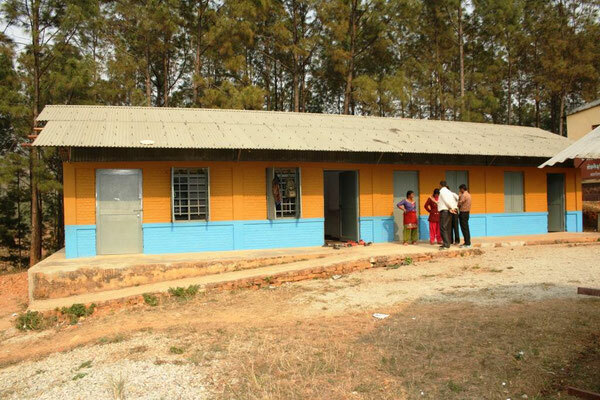 The children are already studying diligently in their new buildings. 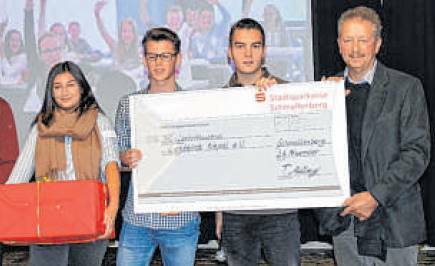 This also pleases the students of the Gymnasium in Schmallenberg - only through their donations, this assistance was possible. 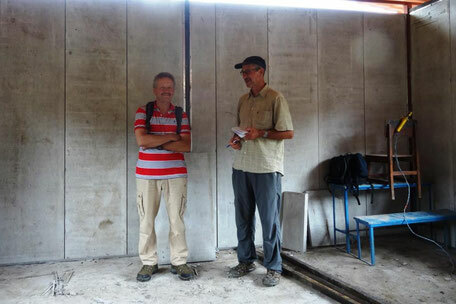 Just a few months ago: Johannes Börger and the team inspected the school in zero kilometers. 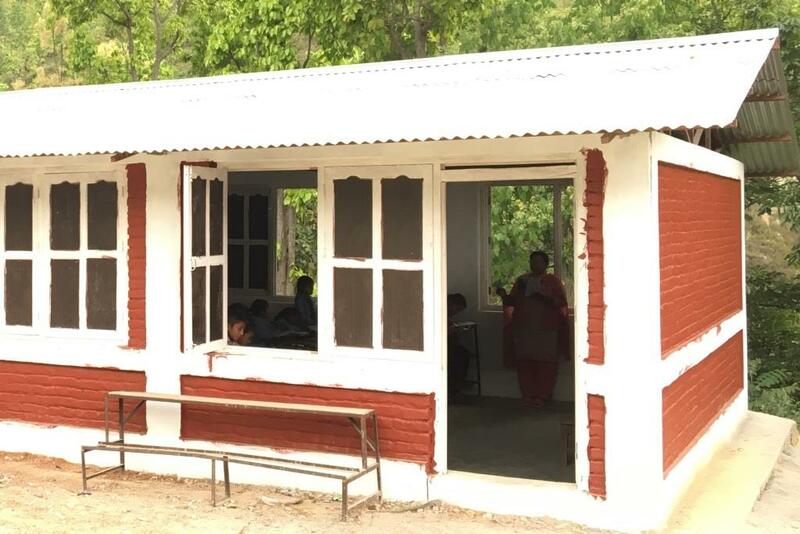 The temporary corrugated iron hut on the right side, which served as a classroom, has now been replaced by a stable Building. 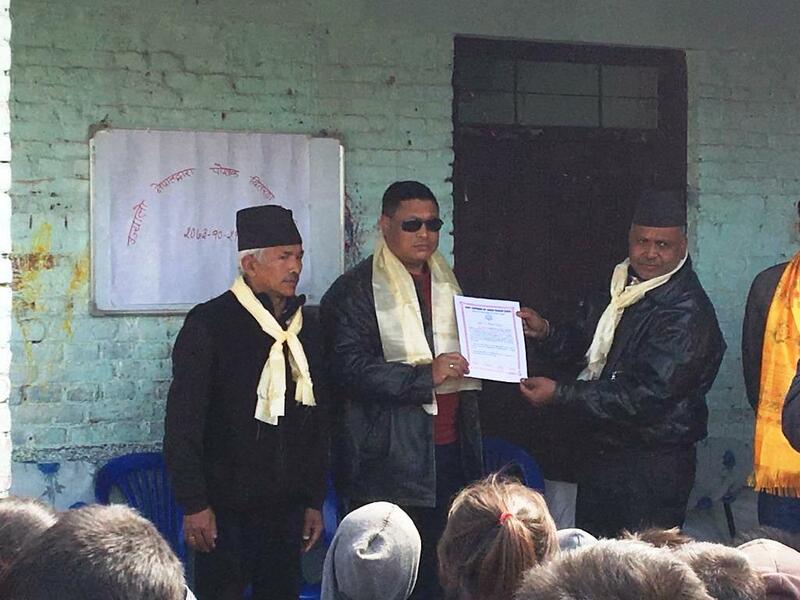 "Two Years after the earthquake"
they also miss the governmental support for the new building. 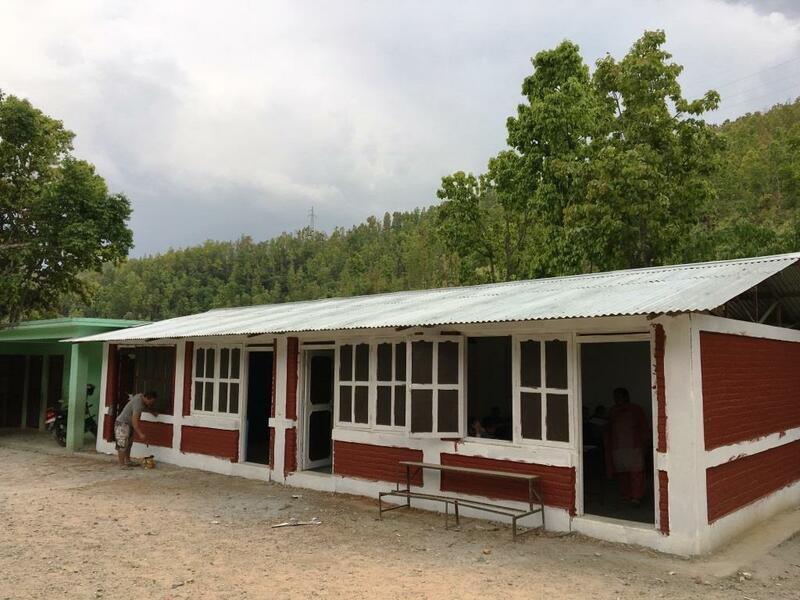 Due to this difficult situation, we decided to rebuild schools and community facilities in Kavre district (40 km north of Kathmandu). 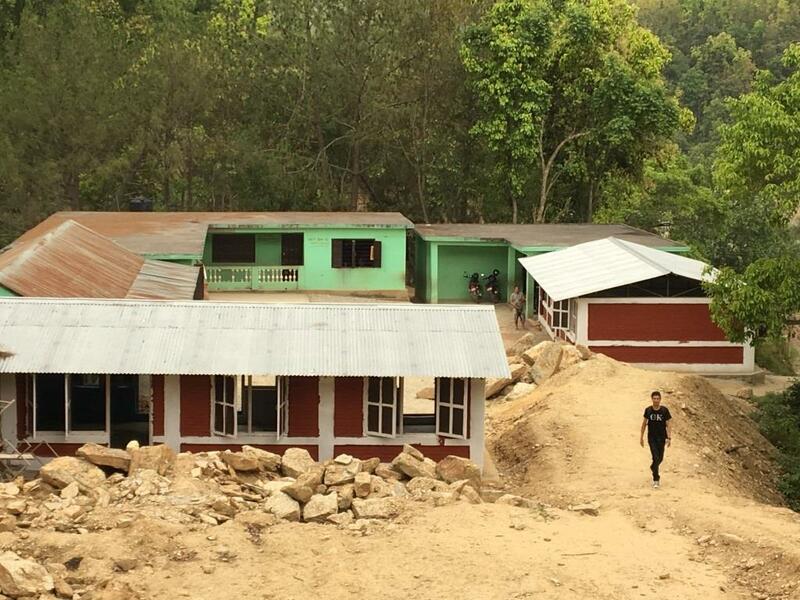 Four schools for the teaching of a total of more than 800 pupils have meanwhile been built with donations from the Sauerland amounting to € 75,000. 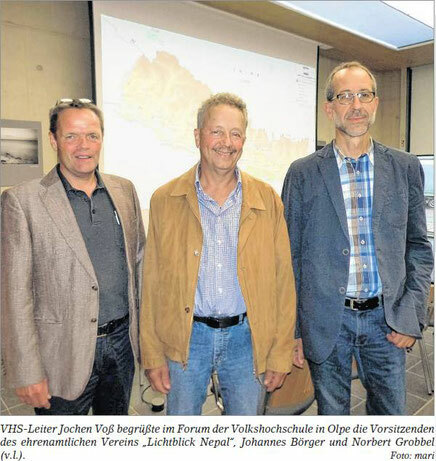 The fifth school in the town "Zerokilometer", which is financed with the donation of the “Städtisches Gymnasium Schmallenberg” of 15.000, - €, is in the completion. 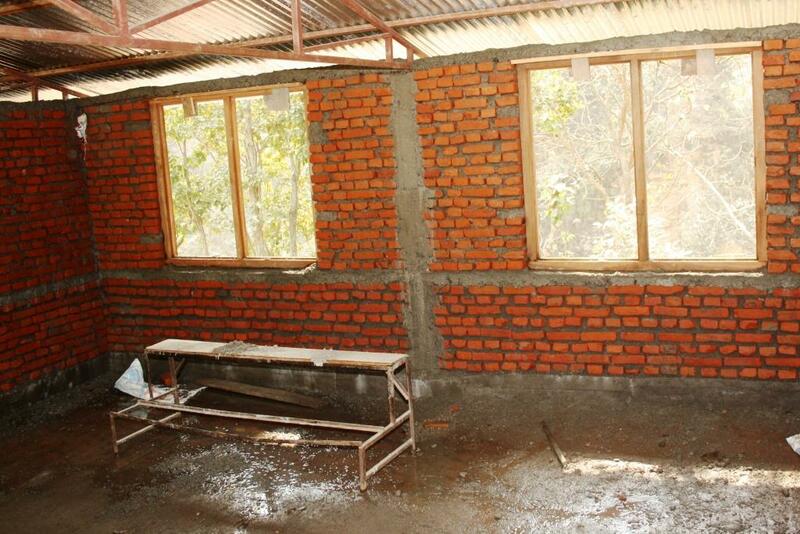 Here, four classrooms for a total of 120 pupils were rebuilt. 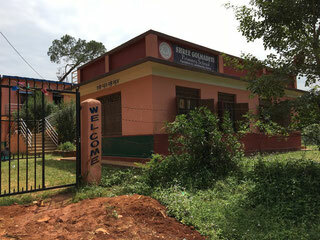 their adult literacy classes in the building. 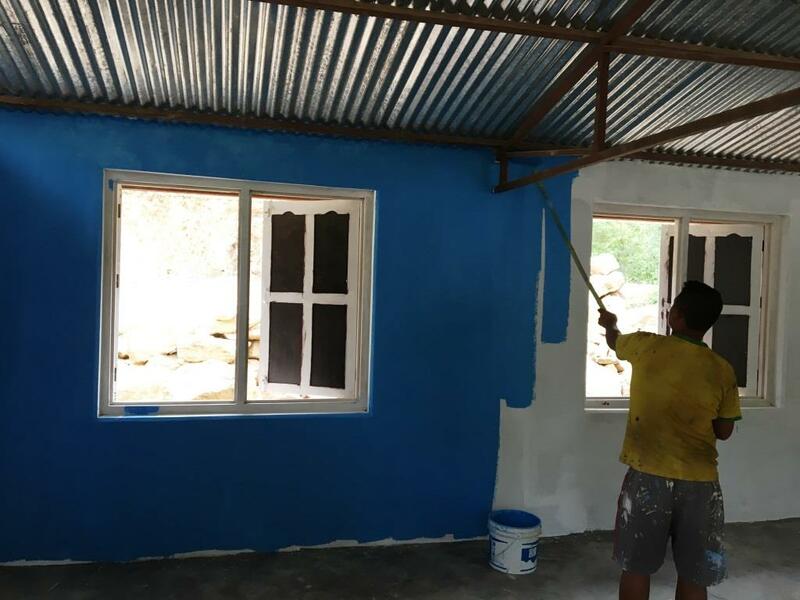 I along with 4 other people had gone there and painted the building and also installed the electric wiring in the room there. Of the approximately 4,000 schools damaged by the earthquake in Nepal, only about 500 have been repaired so far. A further 1,500 are planned or under contract for the repair / new construction. 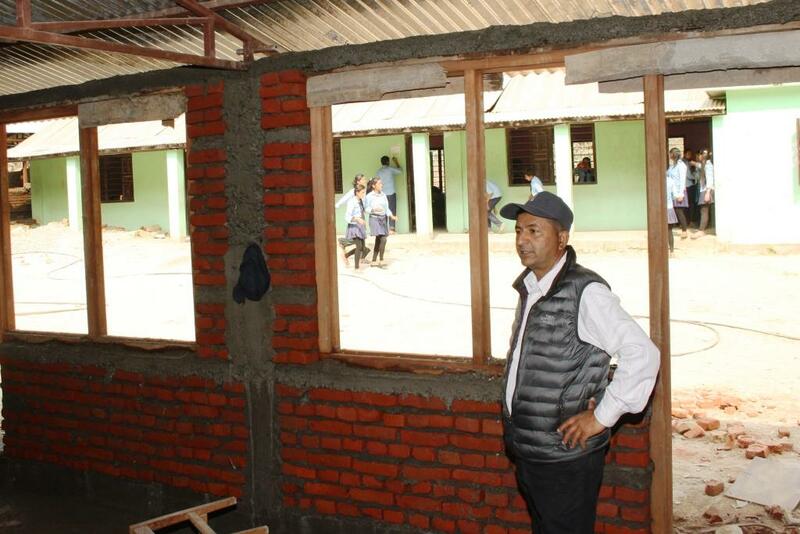 For the remaining 2,000 schools there is yet no clear information on the repair. The administration and the government of Nepal is obviously overburdened with the organization and management of rebuilding the schools. 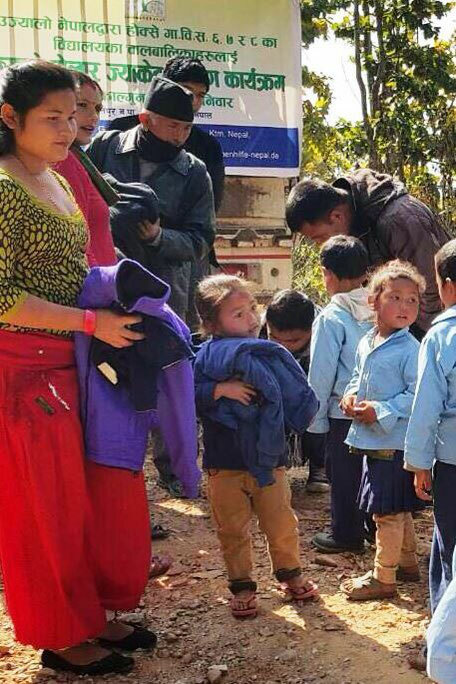 Here, the affected children lose valuable school years. Therefore the pupils, parents and teachers look Forward to the fast and uncomplicated help of Lichtblick Nepal and other active aid organizations. 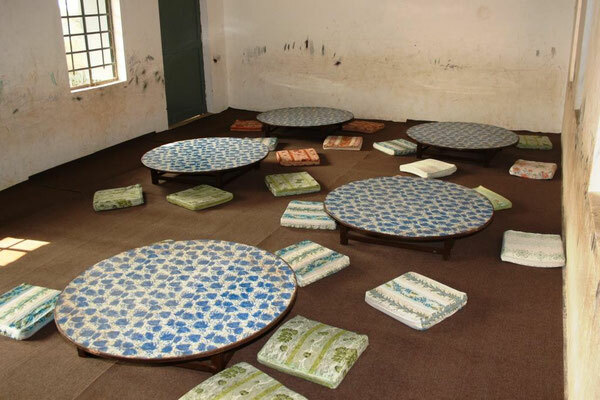 The school in Shikharpur, rebuilt with donations from the Heid Donation Group, has recently been equipped with child-friendly furniture for the nursery school group. 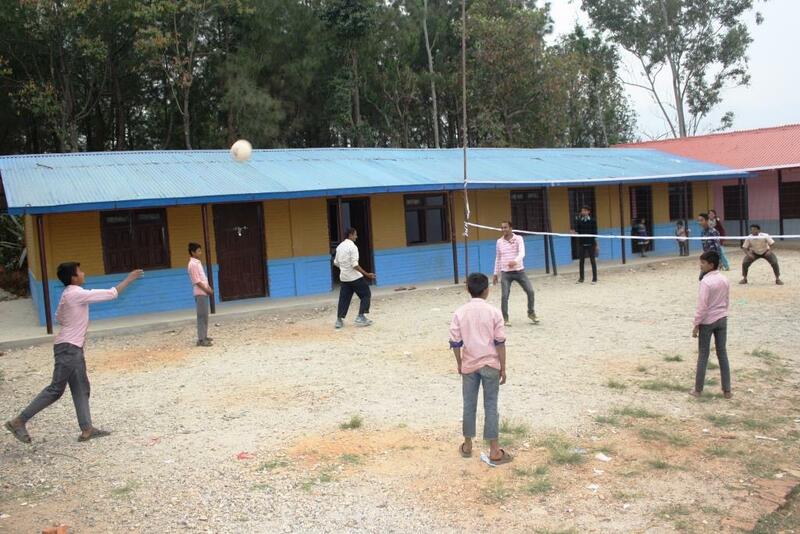 The children feel comfortable in the rooms and like to come to the kindergarten. The village house in Shikharpur, which has also been reconstructed with the donations, serves the women of the village as a Meeting and training center. 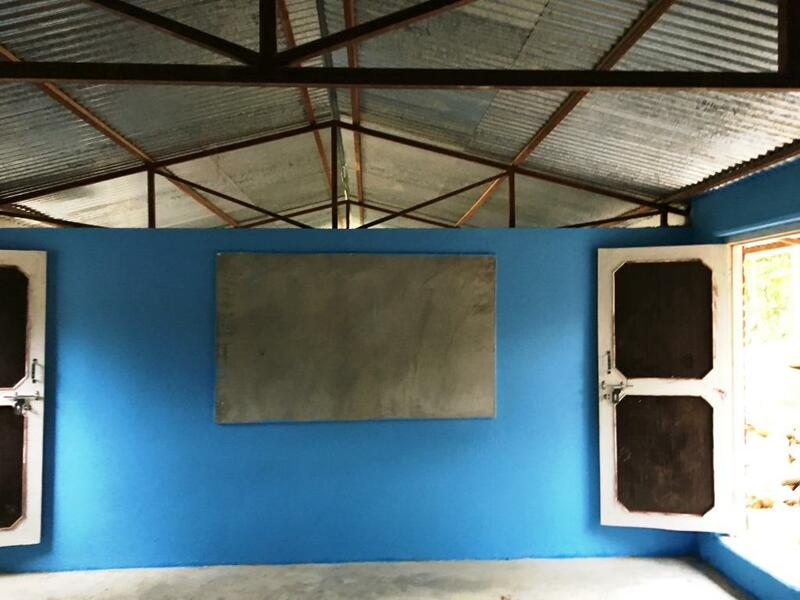 For this to be used even more intensively, the lighting and a whiteboard for the training were installed. 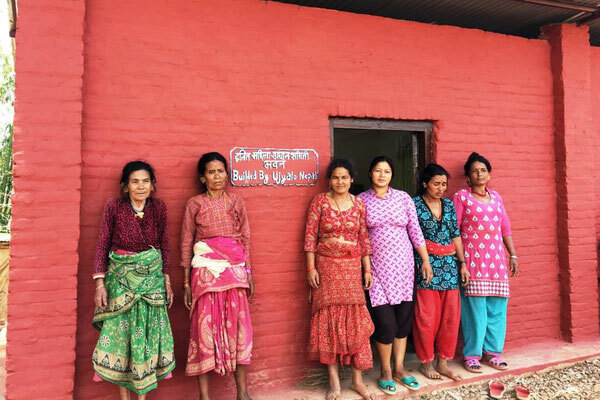 The neighboring village of Aneikot has begun with the construction of a drinking water supply with the help of the Nepalese government. Due to the increase in the cost of construction materials in the past year, there is now a lack of money to be covered for its completion. 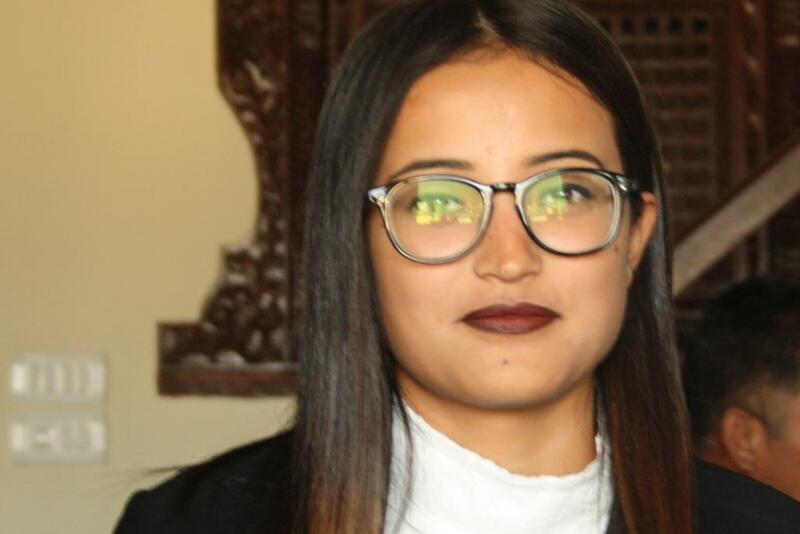 Lichtblick Nepal e.V./ Ujyalo Nepal will be able to finance the construction of a 600 m pipe, a 50 m³ high-tank and the purchase of a pump with a subsidy of approx. 12.000, - €. 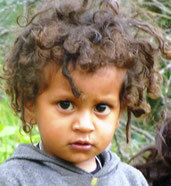 In this way a further 600 inhabitants receive sufficient and fresh drinking water. 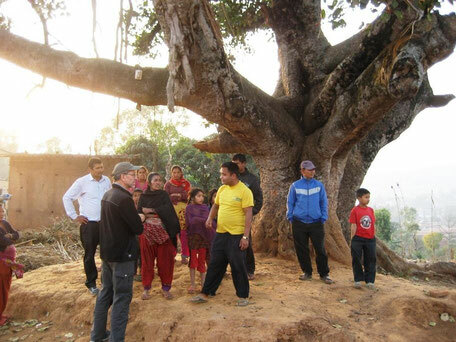 This project is sustainable, operated by the villagers themselves. This support is the classic aid for self-help. 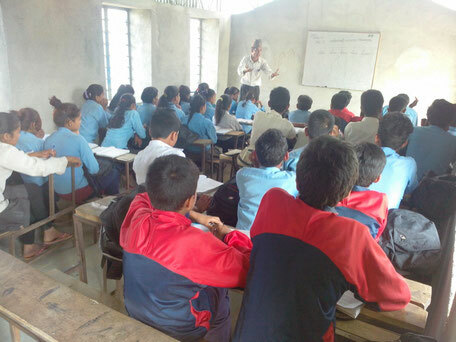 The projects are supervised by members of the Lichtblick Nepal association in cooperation with the partner Ujyalo Nepal in Nepal. 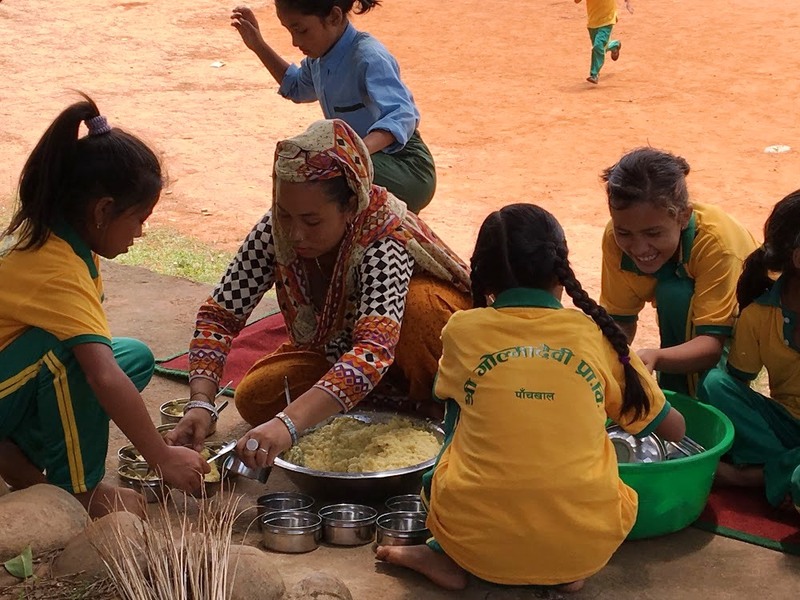 We work in the structures of Nepalese society and help existing initiatives through our additional support to its realization. 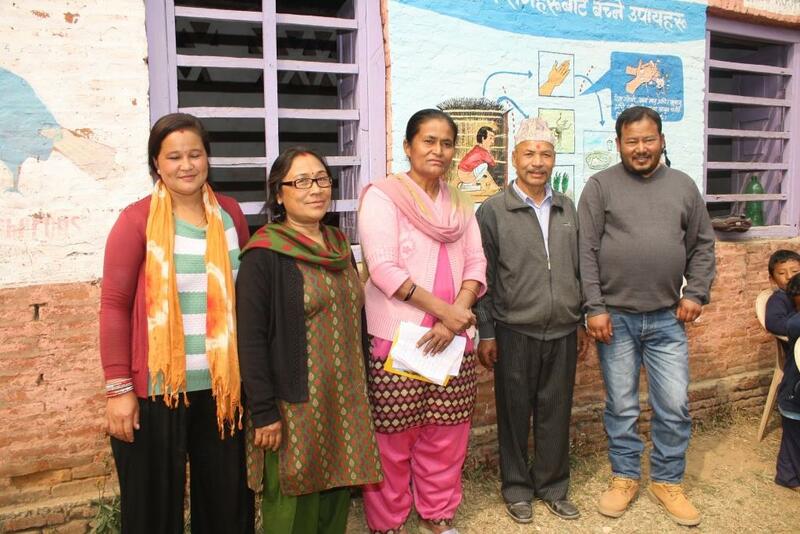 with predominantly low-caste villagers (like Shikharpur). 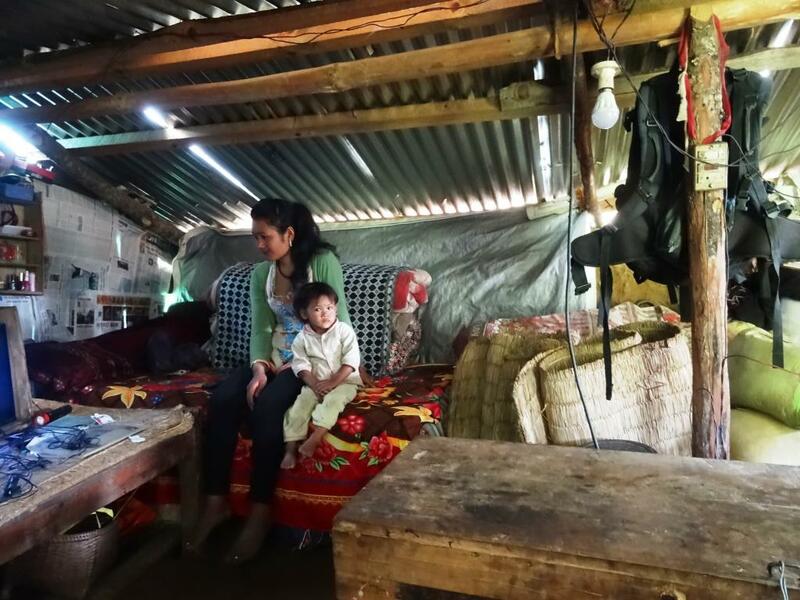 The task of this social worker is the organizational support of the villagers in concerns of everyday life, such as the application processing for a house construction. In addition, the primary needs (e.g. 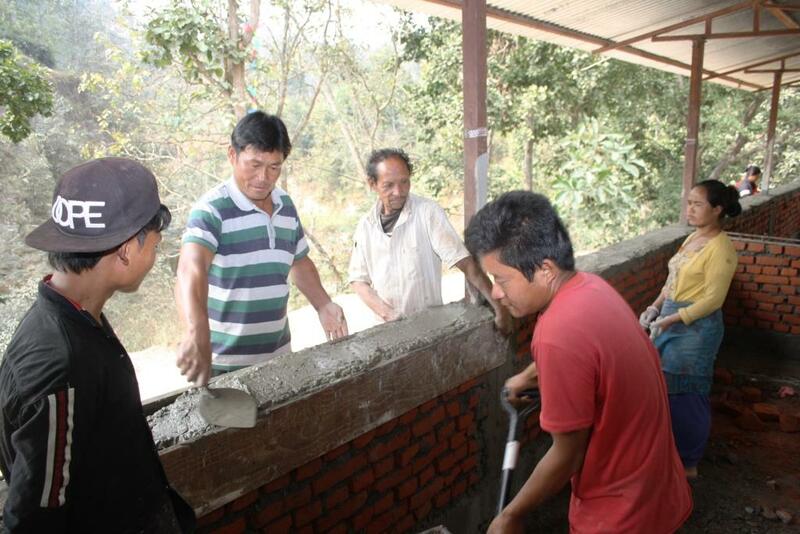 water supply or house building training) should be defined and possible solutions are to be sought. 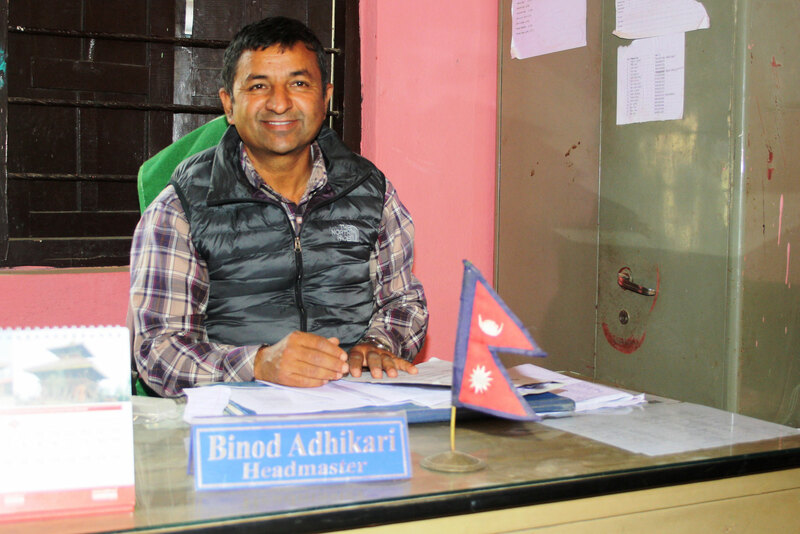 We also see the role of the social worker to be the networking of the existing programs and, if necessary, in supplementary projects co-financed from the budget of Lichtblick Nepal. 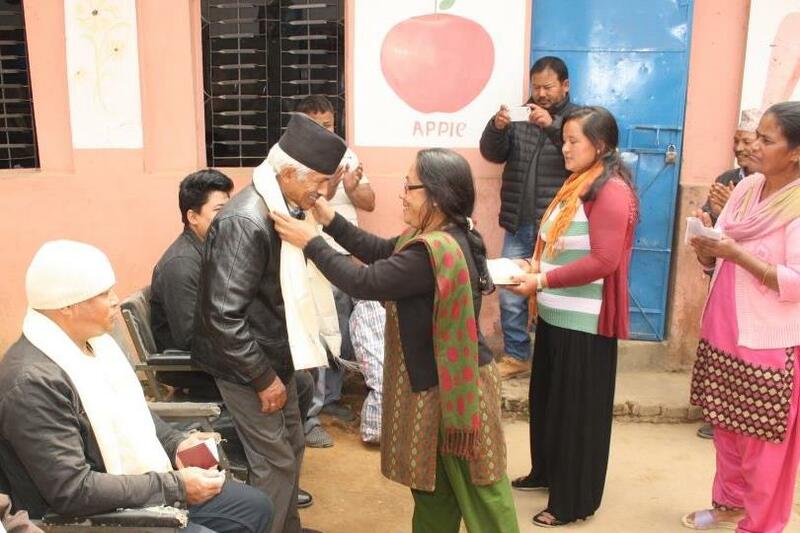 Through the developing close contact with the population we expect a positive sustainable development in the villages, with improved education, the creation of jobs and thus sustainable economic development. Thanks to all, who support the projects !! 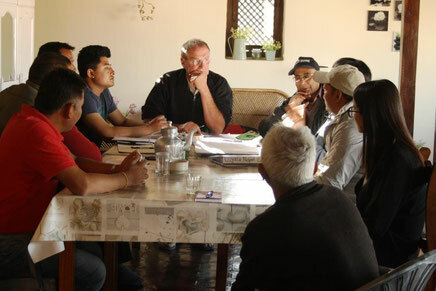 Meeting in Kathmandu - New Members welcomed ! review the process in the different Projects need to fit a specific demand to harmonize. In that context, fast communication and documentation carry huge importance. 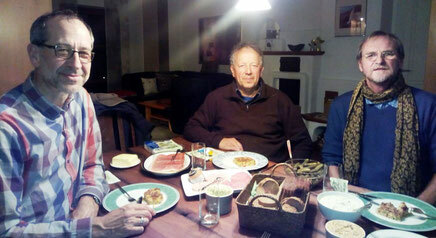 Based on that, "project management" was discussed as the major topic during the meeting. On the 28th of February 2017 15 girls and 11 boys were waiting for the truck. 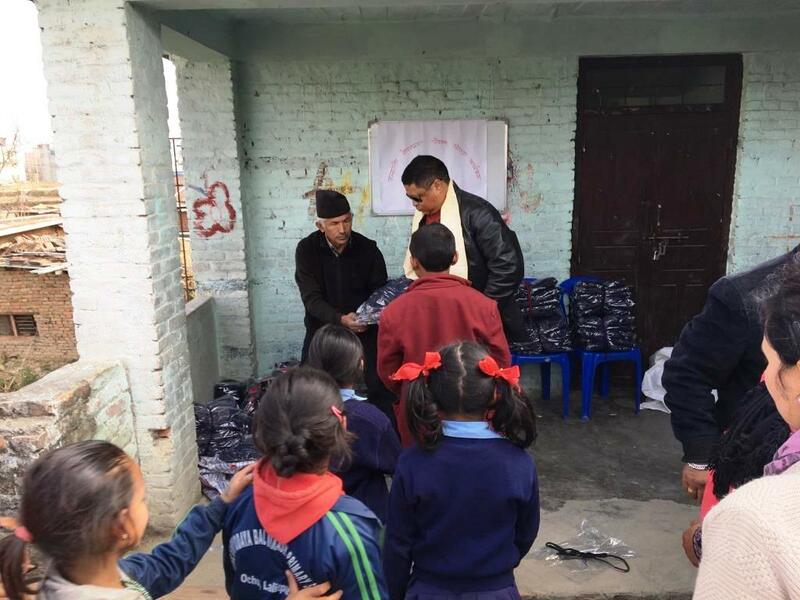 As Bishnu, Amrith and Heinrich Strohmeyer arrived, happiness spread among the children since with them the materials for the new classroom arrived. 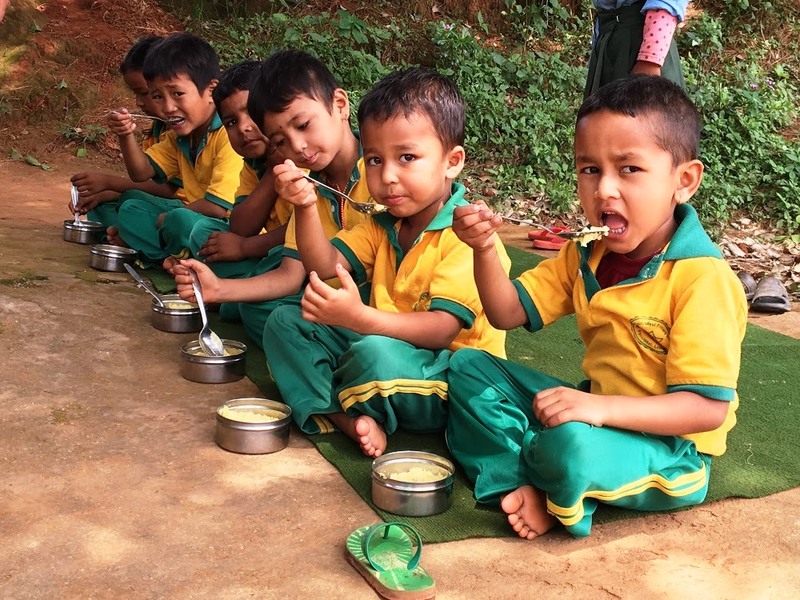 Things like carpets, seat cushions and tables were provided as new furnishing for their classroom of the school kindergarten of the Narayansthan Elementary School.After Amrith and his father Bishnu finished installing the new equipment, the moment was about to come. 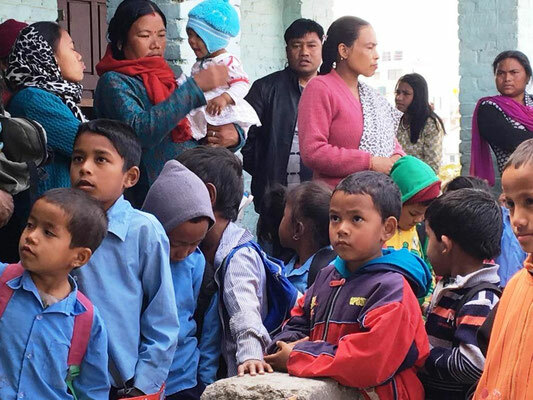 With their eyes wide open 4 in 50 children finally able to enter their new classroom together with their teachers Ms. Ambika Devi Gautam and Ms. Laxmi Duial. Concerning or a project this was the final step to support this school. After building two new school buildings including gutters, water pipes and a water tank the establishment of 8 classrooms with 30 seats and tables, the principal of the school Tikha Bahadur Khafle and his brother Dhauda Praad Khaple were very happy and satisfied. 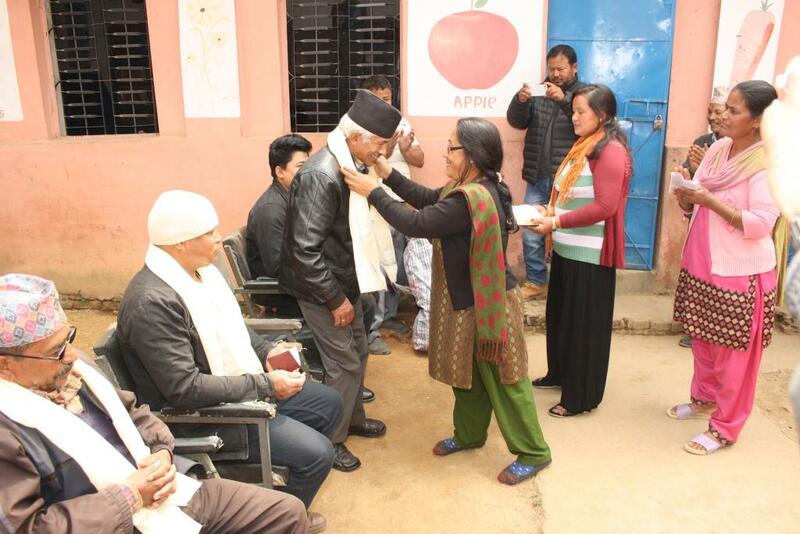 Then again thanked Ujyalo Nepal for all the support. 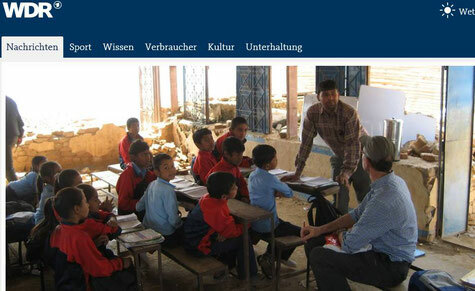 Ujyalo Nepal wishes the children and teachers good luck and joy for the future. You would like to help ? 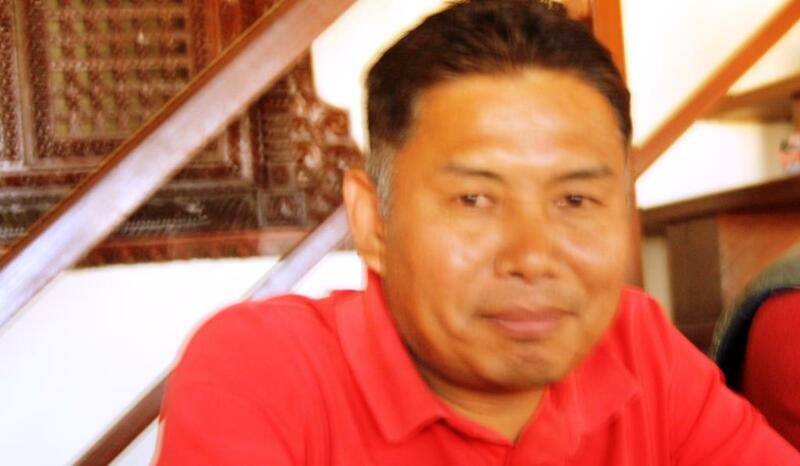 We won`t forget you !! (© jb) Joy over the help !! 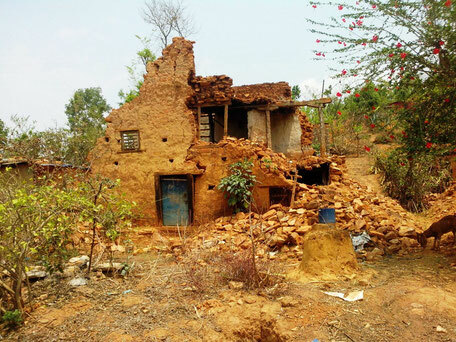 "Thousands of People died last year during the heavy earthquake in Nepal, that affected the poorest of the poor . 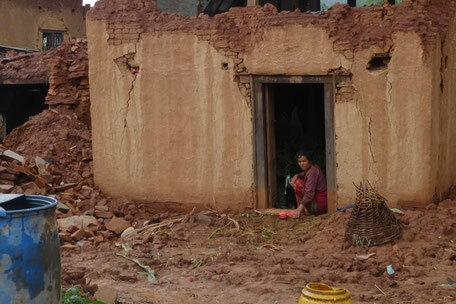 The world is looking at other things today - Nepal is far away again. 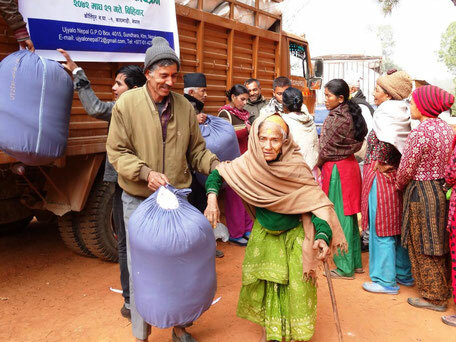 But we continue to help." The students of the Schmallenberg Gymnasium collected a lot of money to enable the repair of the Shree Chandenee Secondary School in Jaishithok, Zero Km. 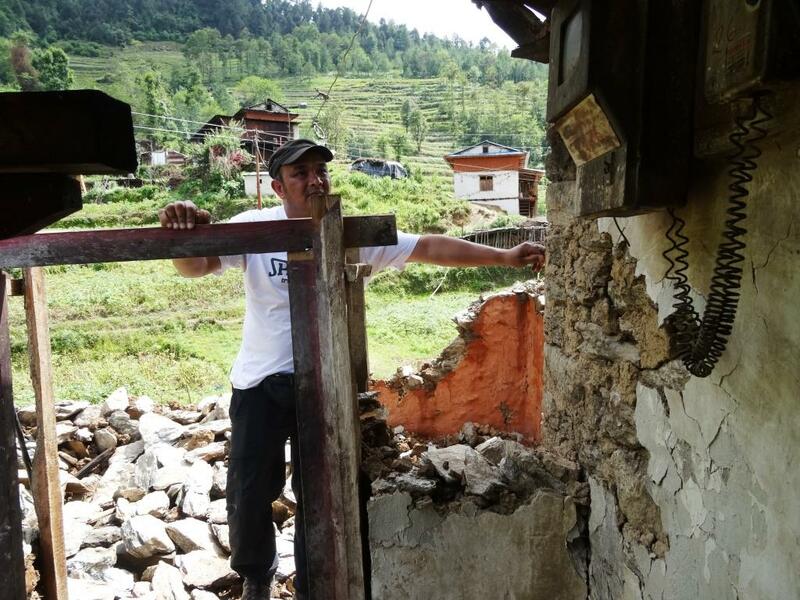 Now there are good news from Heinrich Strohmeyer: For 14 days, builder Sagar Rai has been working 12 hours a day with his crew - 5 men and a woman. 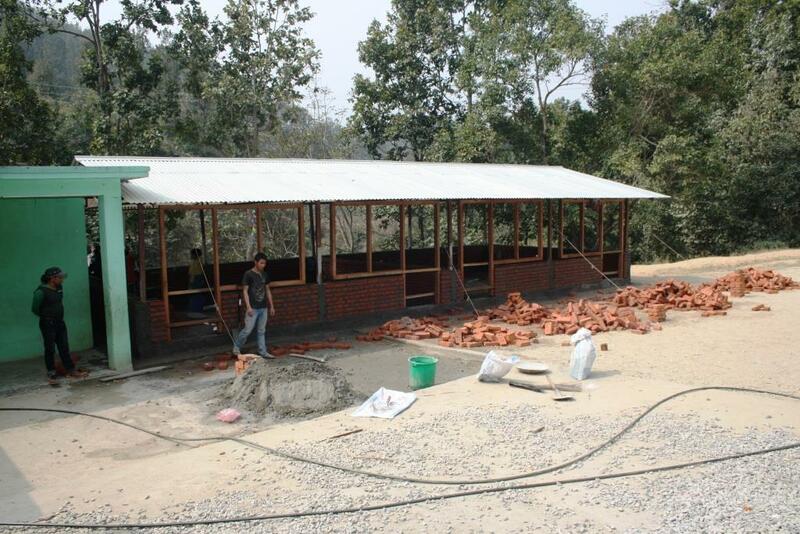 The progress is already remarkable after only a few days, and the building will be ready to be used in the course of two months. 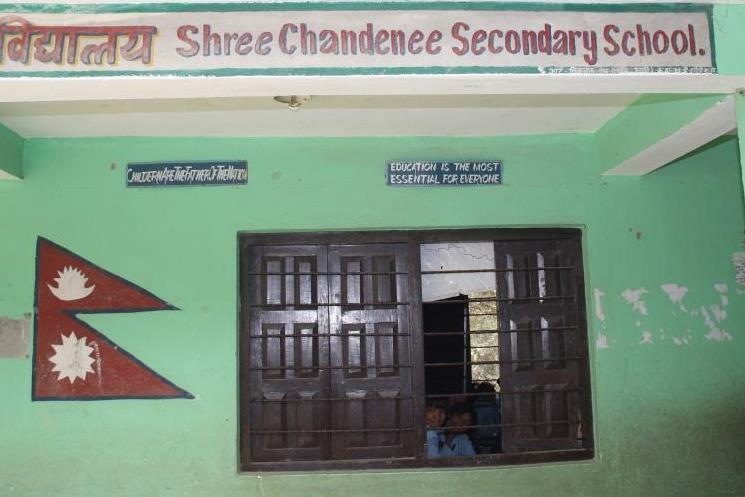 For the 139 female and 91 male students aged between 5 and 18, school continues despite the structural limitations. 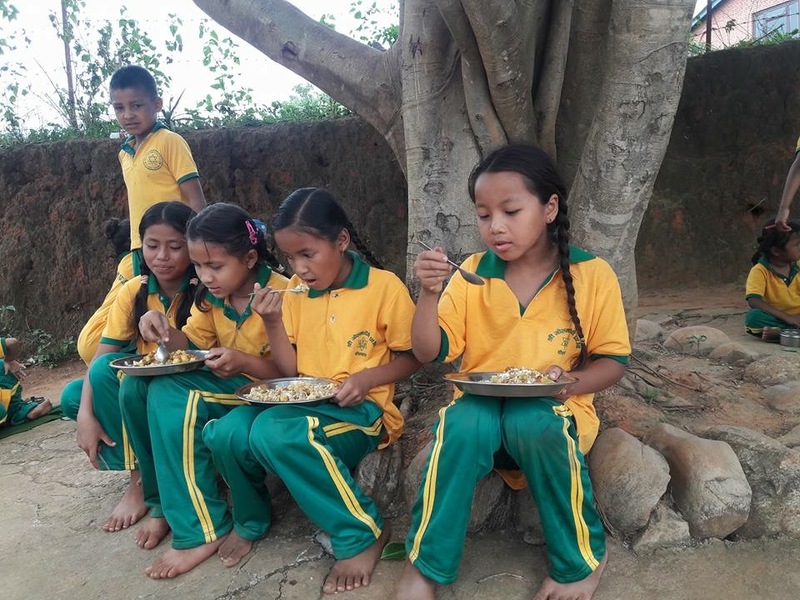 The children all come from the surrounding area, their parents are simple farmers, work in the brick production or are even working on the building. However, the new school buildings offer further opportunities: The headmaster, Mr.. Adhikari and the chairman of the School management committee, Mr.. Neupane are already looking into the future. 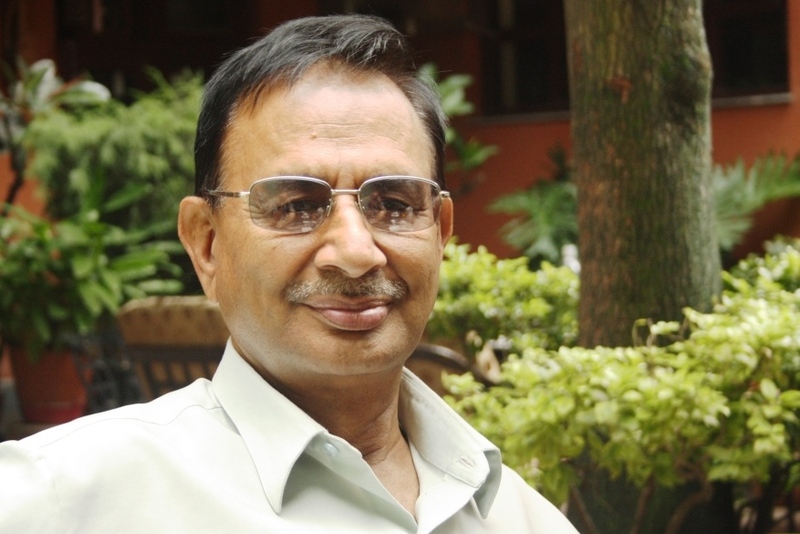 They would like to set up an 11th class in which the topic of "Management" is to be taught. This would make it much easier for many students to enter a profession or even go to University. We would also like to accompany and support them in the future. 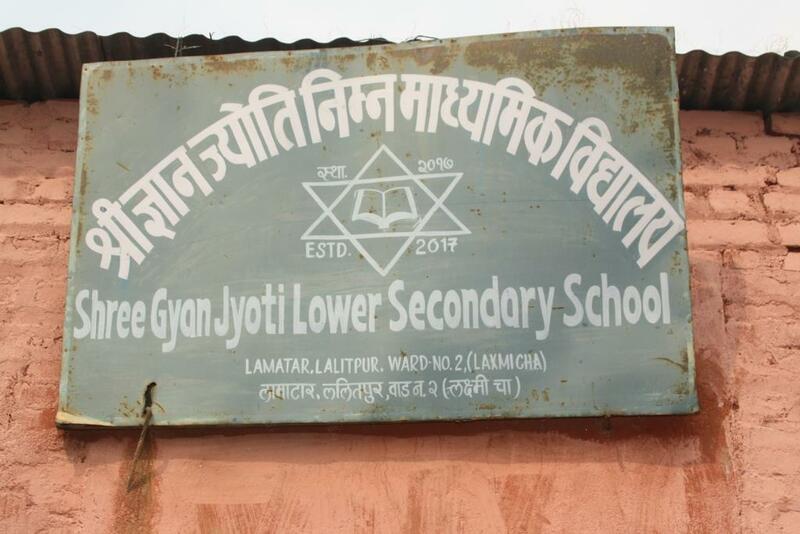 "The Ujyalo team and the school appreciate your support very much. Please help us continue in the future!" 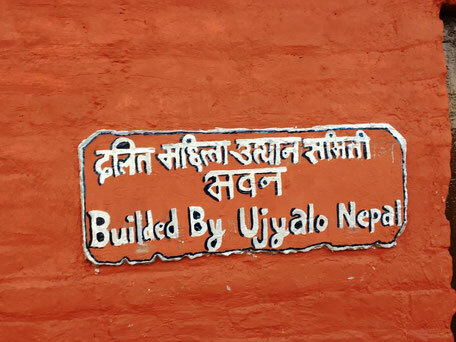 Good news from our friends at Ujyalo Nepal. 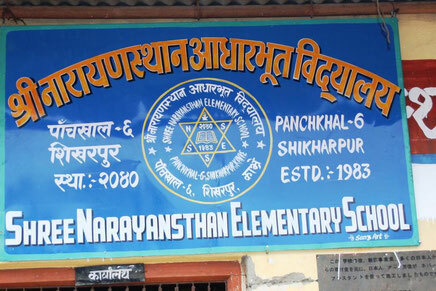 Amrit Malli and his father Bishnu are allowed to hand over the first 30 school benches to the Shree Narayansthan School in Shikapur. Freshly welded together and painted in the typical Nepalese blue. 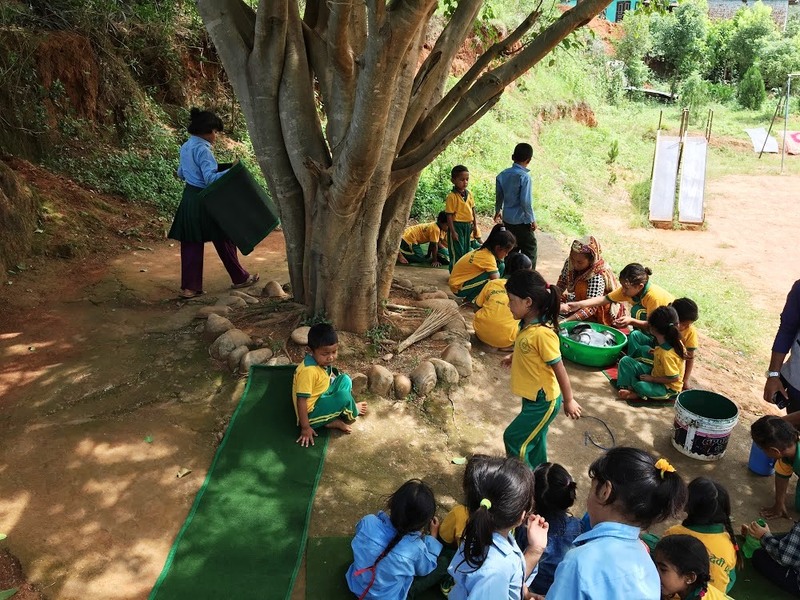 Are the children more motivated to study now? 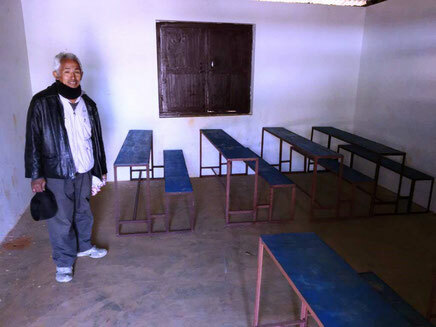 Bishnu seems to recall his childhood days, in which he would have liked to have such school furniture. It is autumn 2016, about 1 1/2 years have gone since the heavy earthquakes. 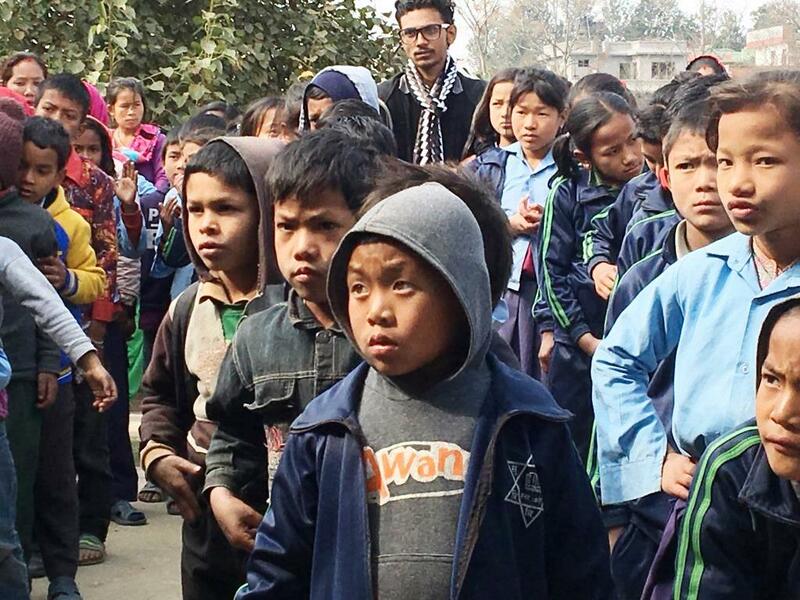 Nepal continues to reach out for a piece of normality. 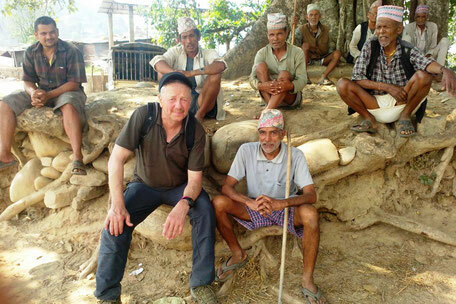 Johannes Börger travels back to Nepal with 17 friends to get to know the beauty of the country and the friendliness of the people - despite the destruction and the lack of support from the government. "Trekking is possible again." Through their presence alone, These tourists, mainly from the Sauerland Region in Germany, significantly help the country and the people. But they do more. Today Johannes and Co. are bringing good news to the 9-year-old Roman Dhakal who is partially paralyzed. 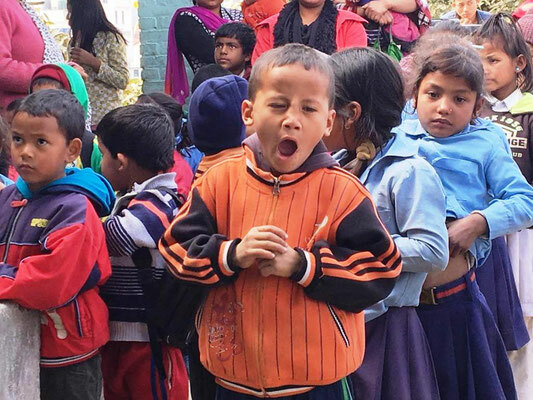 A private initiative supports him with a basic care, but a normal development is hardly possible for the boy under the difficult conditions in Nepal. 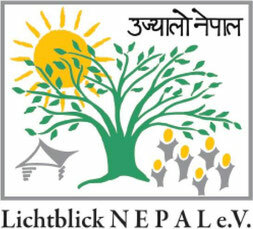 Today, Johannes can inform Roman and his family, that LICHTBLICK NEPAL e.V. 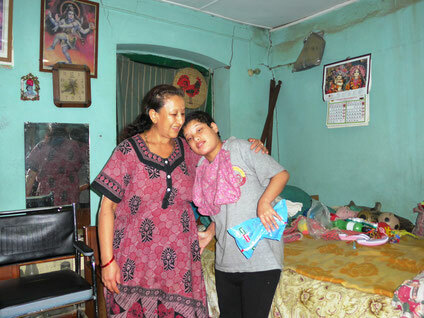 will take care of the additional costs for their care and schooling. The joy is great. 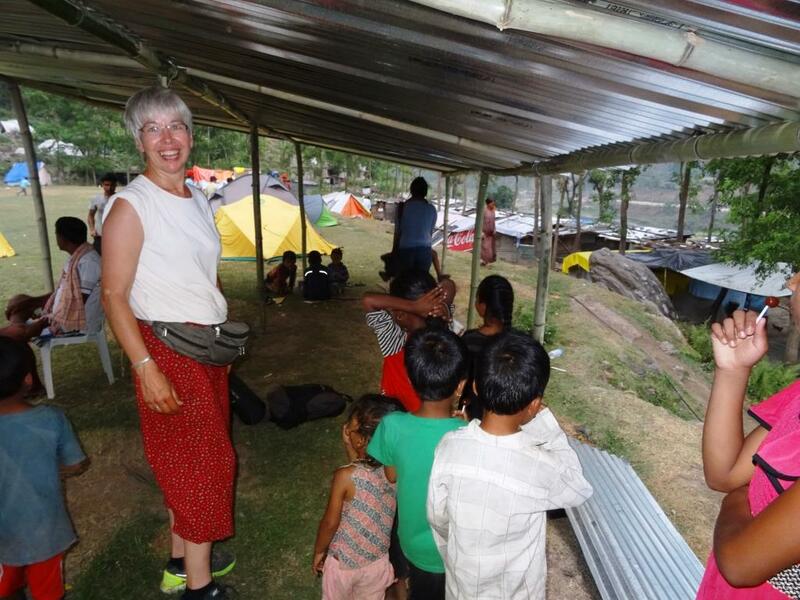 Tourism and humanitarian aid belong together in Nepal - today more than ever. 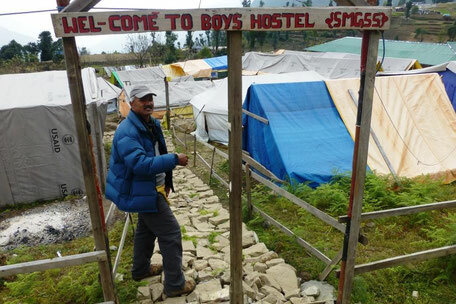 Nepal as well as Johannes Börger and Norbert Grobbel have succeeded in realizing the reconstruction of the heavily damaged school building in a very short time. A worthwhile effort and a great success.The children can now get back to learning. For them there is only one chance in the long term to break out of the wheel of poverty - education. schools, school and learning material for the students are missing. But, we're working on it! " 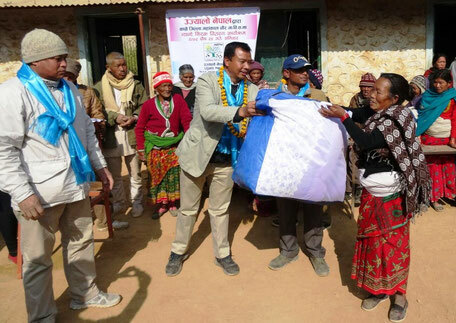 In the autumn of 2016, Johannes Börger and friends from the Sauerland region went trekking in the Annapurna region, along with Sherpas from the earthquake areas. 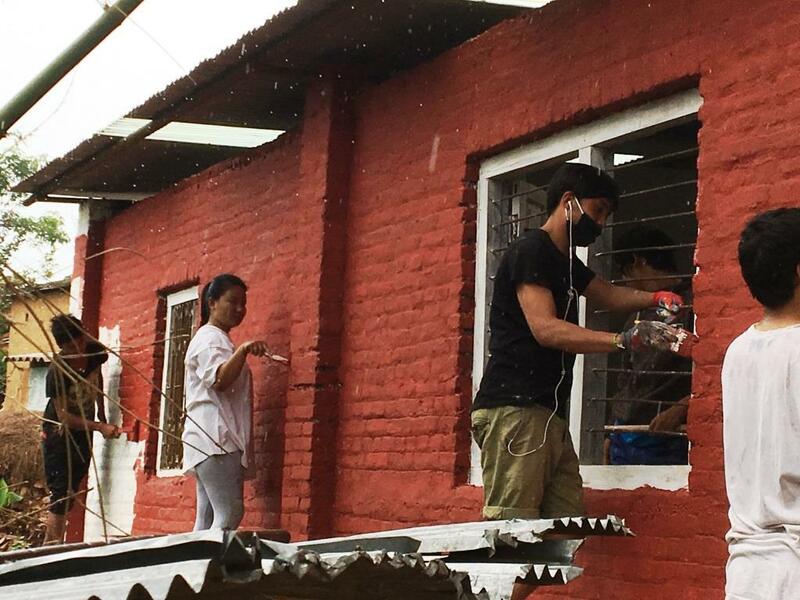 They want the tourists to come back to Nepal, get to know their country and give them work. Trekking is possible again. Great impressions from their trip. Our trekking groups in the autumn of 2016. 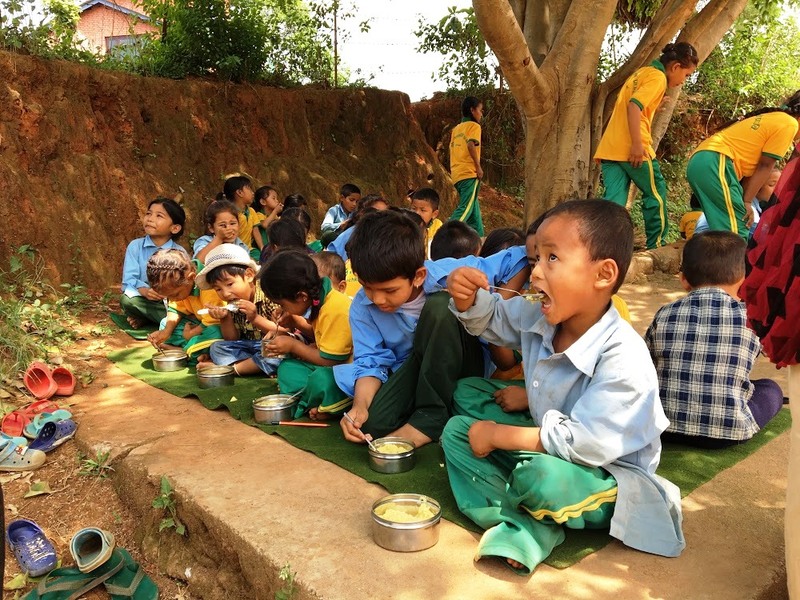 Nepal: Not only a crisis area, but also a hiking destination? The well-known, international travel guide "Lonely Plant" published it straveling trends for next year. On place 5 of the "TOP TEN COUNTRIES": Nepal. 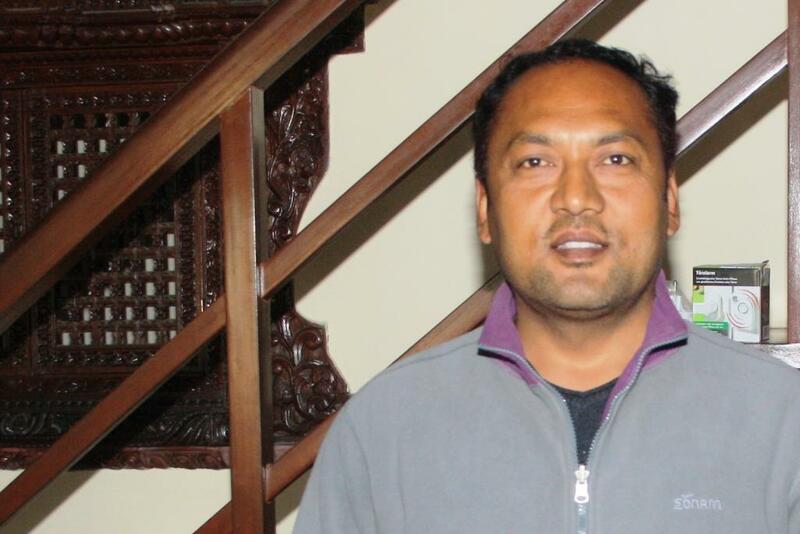 At the best value for money, Nepal even ranked first! 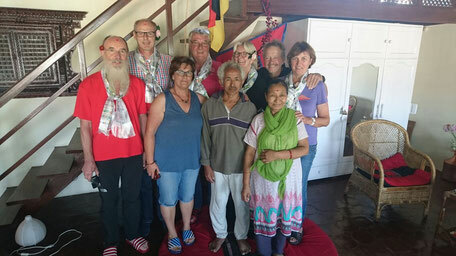 17 tourists, who have been traveling together with Johannes Börger in the mountains of the Himalayas and have lived close to the people and talked a lot with them can now explain the reasons for the ranking. 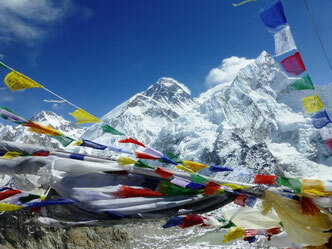 Dreamlike, overwhelming nature, extremely hospitable, polite and humble people and fascinating cultures. This is a travel experience. So what about the earthquake areas? 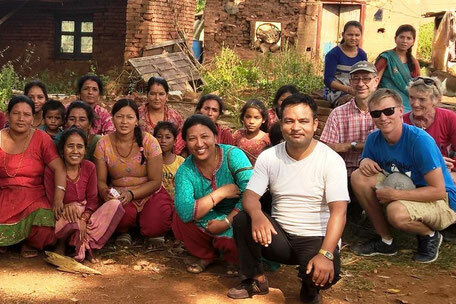 The guests, accompanied by Johannes and some Nepali friends, could take a picture of the people in the earthquake areas and get impressions about the progress of our aid as well as the practical possibilities, but also difficulties. 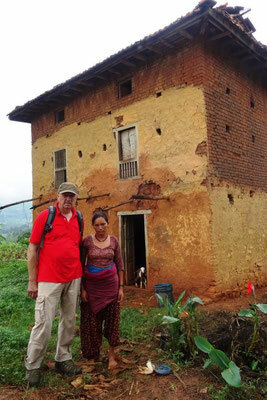 For all travelers this was a special and valuable experience. 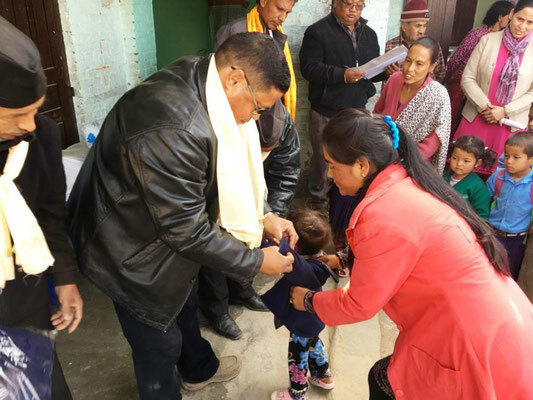 And the victims of the earthquakes also benefit from these visits. 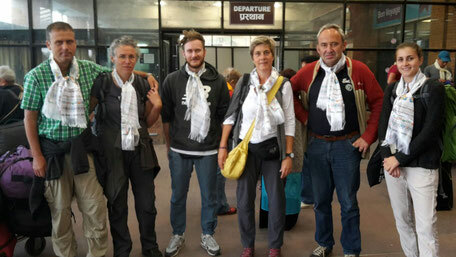 They wish trekking guests to come back and are very happy about the understanding and interest they are facing. They do not want to be forgotten - and we do not want to forget them. Thank you all travelers and guests for your interest !!! 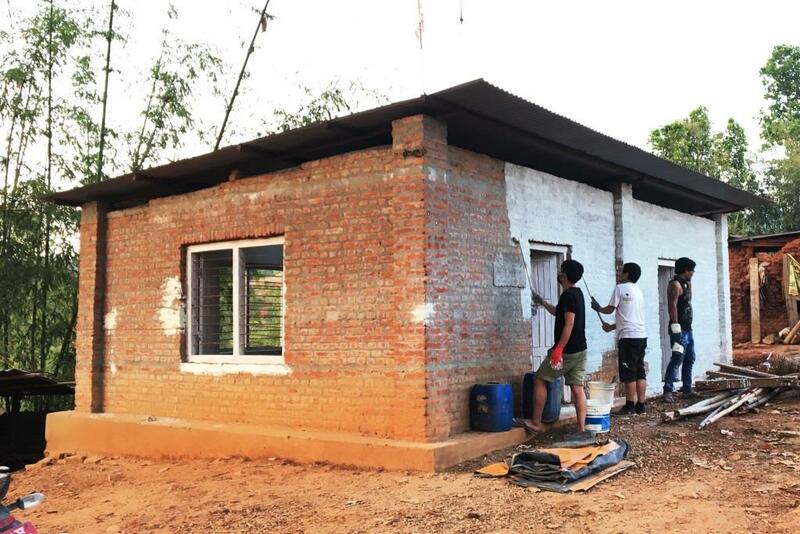 over the cost of restoring the building and facilities. 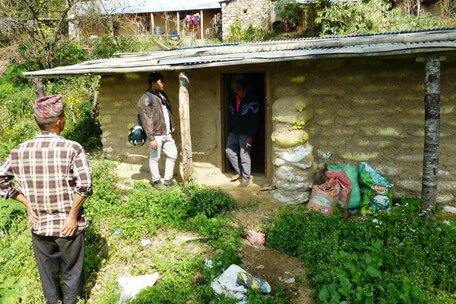 Finally a piece of normality, a piece of everyday life returns to the people of the village. 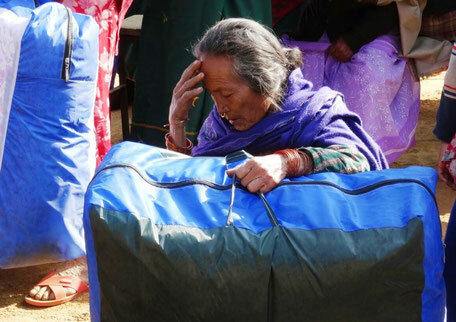 After the earthquakes in Nepal, our helpers still encounter intolerable life situations. 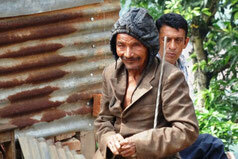 This elderly lonely man has built up a hut. It will not withstand the storms of the rainy Season.